I know this week has been rife with gag-worthy awful tattoos, so let’s end it with a palate cleanser. 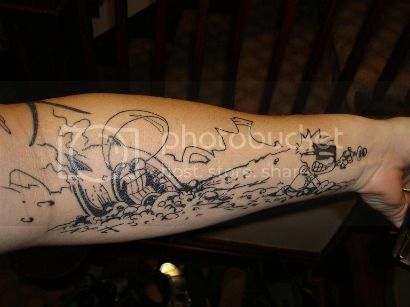 Reddit user CaptainInsano literally traded electrical wiring services for a tattoo of Spaceman Spiff from Calvin & Hobbes. Seems like a fair trade, although I probably would have been willing to trade something even more valuable. To see someone not me get this tattoo scrawled across their arm. Via Reddit, who finds that cleansing the palate with tattoo ink doesn’t usually have the intended effect.